Written by experienced professionals in the fields of nursing and communication, this unique text helps nurses and other health care professionals improve their personal communication style for more effective provider-patient communication. This third edition delivers up-to-date, fact-based research and theoretical information in easy-to-understand terms. New models of communication have been added as well as a new chapter on multi-cultural issues. New material on communicating across the lifespan has been integrated throughout the book. All nursing and allied health students. Northouse, Peter G.; Northouse, Laurel J. 4. Health Communication: Strategies for Health Professionals (3rd Edition) [Paperback] Northouse, Peter G. and Northouse, Laurel J. 5. Health Communication: Strategies for Health Professionals (3rd Edition) [Paperback] Northouse, Peter G. and Northouse, Laurel J. 6. 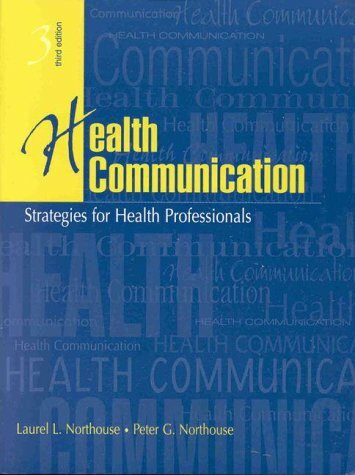 Health Communication: Strategies for Health Professionals (3rd Edition) Northouse, Peter G. and Northouse, Laurel J. Health Communication: Strategies for Health Professionals (3rd Edition) Northouse, Peter G. and Northouse, Laurel J.
Northouse, Peter G.Northouse, Laurel J.